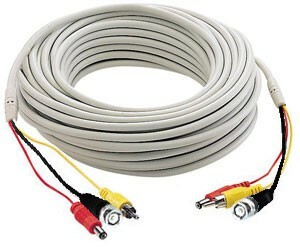 This is a combined audio, video, and power camera cable that is great for use with cctv cameras that have built-in microphones or added external microphones. Even if your camera does not have audio, you can use this as a siamese camera cable for a 150ft run. On each end the cable has one RCA male connector for audio, one BNC connector for video, and a standard 12V DC power connector.